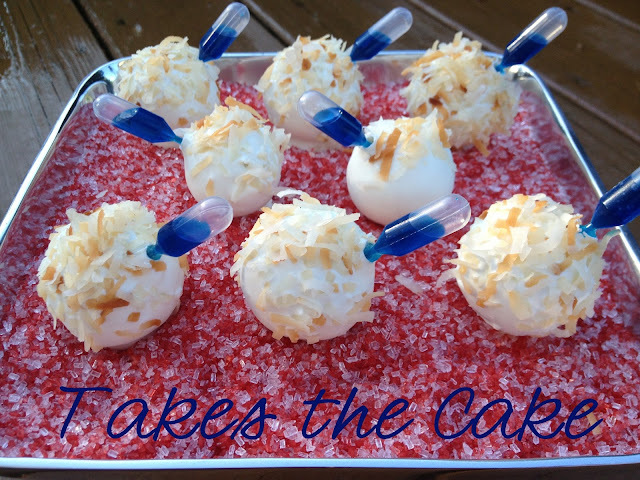 This week I have Bob and Anna from Takes the Cake sharing their Pina Colada Cake Pops that come with a shot of Malibu Rum! How tastey! We are best friend bakers that have turned our hobby and passion into a fun and exciting career. 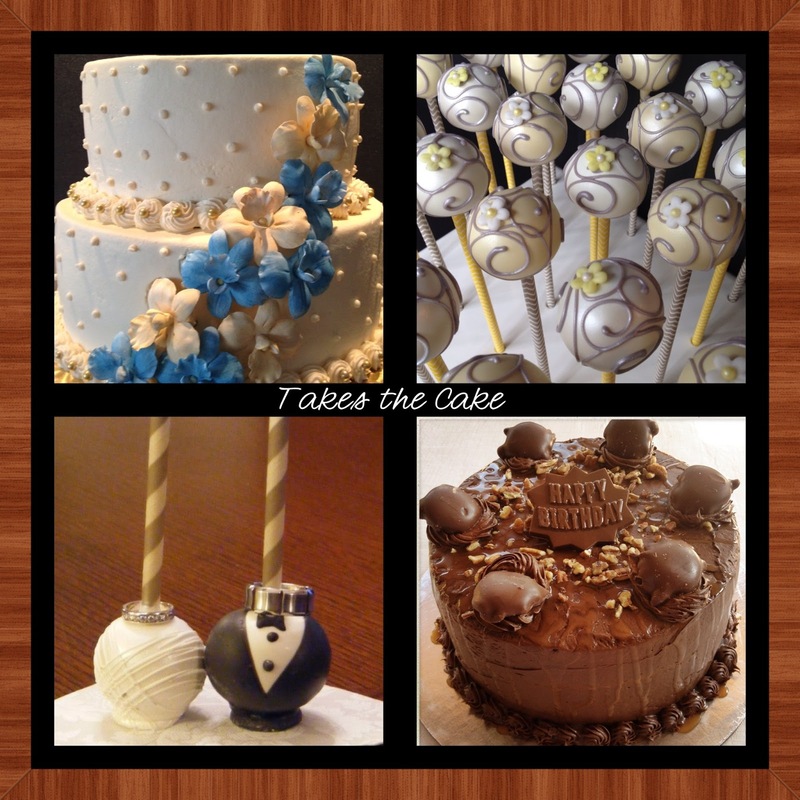 We love to create everything from Cake Pops and Oreos to Cakes, and we love the challenges our clients bring to us every week. We are so excited to share our Cake Balls with a Kick! 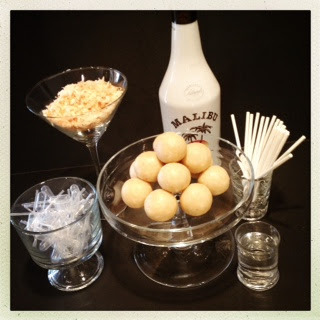 This alcohol infused Pina Colada Cake Ball, with a Malibu Rum chaser, will be sure to be a hit! These Semi Homemade treats are fun and easy to make. We used one white cake boxed mix (follow the box instructions), added a package of Jello instant coconut cream pudding mix (dry, no additional liquid), and also added a cup of shredded coconut. Bake the cake as directed. While the cake was cooling, we made our Malibu Rum buttercream. The frosting has just enough of a kick, but not an overwhelming alcohol taste. Once you’ve made the frosting, mix it together with the crumbled cake to create your cake pop dough. Form the balls, chill for 20 to 30 minutes, and then you’re ready to start the dipping process. When we make the cake balls with the pipettes, we always put the stick to the side. This will be where the pipette will be inserted once the chocolate sets. We also like to use a melting disk on the bottom of the cake ball. This way they will sit flat. Before the chocolate starts to set, sprinkle on the toasted coconut. Once you’ve allowed the chocolate to completely set, it’s time to remove the lollipop stick. Carefully hold the cake ball with one hand, and slowly turn the lollipop stick with your other. You will feel the stick come free from the cake ball. 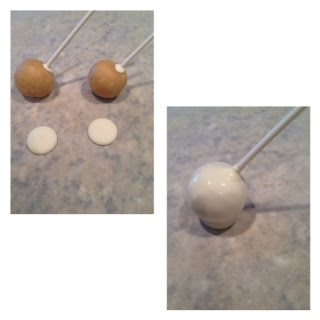 Once the stick is completely loose, remove it from the cake ball. Grab your pipette and your rum and squeeze away. (This adds just a small taste of alcohol to go with the pop). 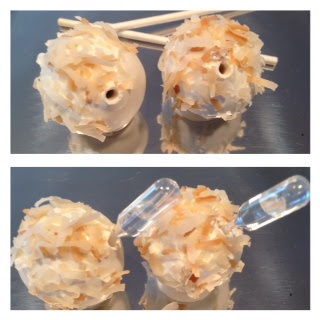 Insert the rum filled pipette into the cake ball, in the hole where the stick was, and BAM! you have a Cake Ball with a Kick! We tell our guests, when eating these great treats, to take the shot of the alcohol then a bite of the cake ball as a chaser. Enjoy these Fun treats! You can spice it up a bit, by adding a few drops of food coloring to the Rum. And don’t be afraid to be creative and mix fun flavors. Use your imagination — Banana Cake Balls and Frangelico, Chocolate Cake Balls and Godiva, and so much more! Thanks so much Bob and Anna for sharing this recipe with is this week. I can’t wait to order some Pipettes and make my own alcoholic Cake Pops!